The Turkeys were butchered out at 8 months old. The white tom weighed 52 lb, bronze tom 48 and the hen 26 lb--that was after being butchered. They were butchered on November 14, 2012. 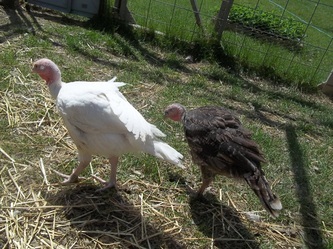 The breeds of Turkeys I have are the commercial kind. 1 White Broad-Breasted and 2 Bronze Broad-Breasted. The white is a boy and the other 2 I have a boy and a girl. They have been fun and fairly easy to raise. I haven't had any problems with any diseases with my Turkeys and Chickens. We got our Turkeys in our home town farm store when they were having chick days. 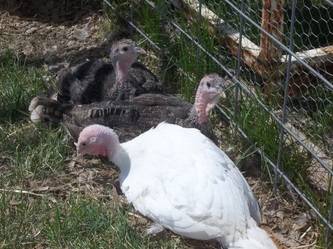 The Turkeys are from Town-line Hatchery located in Michigan. 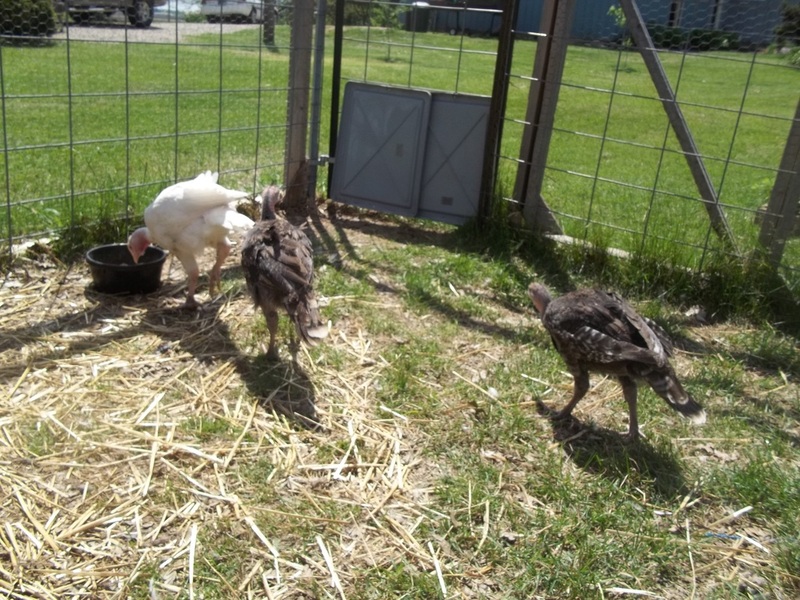 Our Turkeys are growing very fast, but that's any Turkey for you. We started them out on NatureWise Meatbird Crumbles which is 22%. It says on the bag it can be fed to Turkeys. Currently they are on an 18% Medicated Chow- Country Feeds Chick Starter Medicated. They like it real well. They are going to be switched to Country Feeds 'All Flock'. They love grass and anything else they can get thier beaks on. They like to peck at my shorts when I go into their pen. They get to roam in the garden under supervision and are good weed eaters. The white turkey though likes to eat the plant leaves- the bronzes don't. They love strawberries. Any strawberries we have in our strawberry beds that we don't eat they love. They chase each other around trying to grab it from each other. They love to eat big pieces of grass from your fingers. Just don't lay your hand flat out or they'll peck ya! PICTURES BELOW ARE OF THE TURKEYS AS LITTLE ONES.